Grameenphone always strives to ensure uninterrupted use of mobile use. As a responsible citizen of the state, to use mobile phone providing correct information and identification is civic duty towards the country. 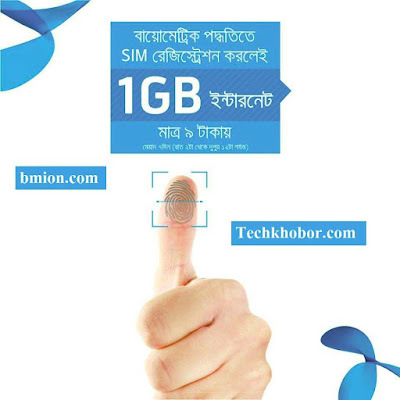 Grameenphone is offering an attractive data offer to the subscriber who will re-register their existing SIM and New SIM through biometric process will get 1 GB at BDT 9 only. After successful re-registration all the existing SIM and new SIM will get the following offer. All GP post-paid and pre-paid (except ERS, BS Postpaid and Prepaid) customer will get the offer after successful re-registration. A customer can avail the offer once during the campaign period. Launch date 25th February and it will continue until further notice. Use of Illegal and Unregistered SIM is harmful for you and the country.